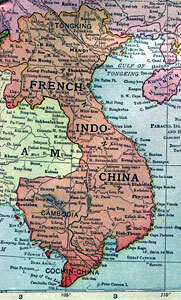 French Indochina used to be part of the French colonial empire which is located in Indochina in Southeast Asia. 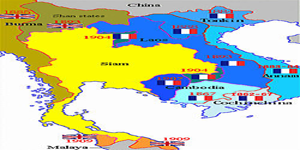 French Indochina comprises of a federation of 4 protectorates which are namely Tonkin, Annam, Cambodia and Laos. It also includes one directly-ruled colony (Cochinchina). 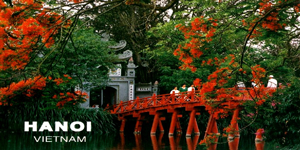 Hanoi, the present day capital of Vietnam used to be the capital of French Indochina during the colonial times. An old rickety wooden passenger boat clacked and clanged across the Vietnamese border on the Mekong liquid highway of days long past. 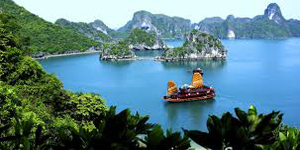 The change from Cambodia to Vietnam was immediately apparent, crisp red starched uniforms of the immigration officials and wide conical hats moving efficiently through the rice fields, orchards and fish farms. Vietnam is at work. Struggling and freeing itself from the past. Vietnam lost generations to capitalism, to communism, the Cold War of the late 20th century was anything but cold in Vietnam. As I travelled down the winding labyrinth of one of the mightiest and most beautiful rivers in the world, the sun setting into its vast delta, I meet an old man who told me a story. Vietnam had a terrible war the lasted for many years, he said over a glass of rice wine floating with herbs changing the colorless liquid into an earthly green. He spoke about the Americans, the French and the Russians who fought one of many of their colonial wars in Vietnam, using the Vietnamese as disposable pawns in deadly power game that nearly destroyed the world, their country, history and identity. The yoke of the past has been lifted. Vietnam is now open for business. My first stop was a larger town in the wide green delta. Chau Doc. Happy and friendly local people were busying themselves pointing directions and selling just about everything. A teenage entrepreneur arranged a horse cart to wobble me to the hotel. Everything was relaxed, except for the dog that bit me, though the dog wasn't the rabid mangy street hound that you can occasion on the streets of Southeast Asia, rather a six inch tall Pekinese guarding its territory. And in its defense, I did smell a little funny and he didn't draw any blood. 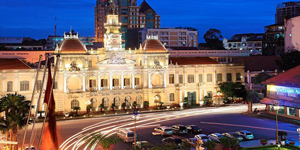 After a night's rest in this rural center, I took a bus to the capital, Ho Chi Minh City, also known as Saigon, and before Prey Nokor, the "forest city" to its first Khmer inhabitants. It is now nothing like its original name. 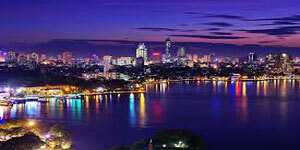 Arriving into Ho Chi Minh City on new streaming asphalt roads, I see a vibrant, exciting, cosmopolitan city. A city of tomorrow, with the elegance and charm of its near and far past. 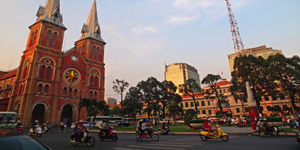 Ho Chi Minh City is divided into districts the same way that French cities are designed. I stayed in District One, in the heart of the old city within walking distance to most of the sights. There is always so much action and drama in these narrow alley ways right below the balcony of my room in this small, family run guest house. Shouting, screaming, crying, things breaking, laughing and of course the signature of Saigon, motorcycles. But these narrow passages are almost too small for even the finest of Saigon's motorcyclists. Most of the noisy mayhem is human activity. This perpetual commotion will linger way past midnight, though by far, the most turbulent time is just before the six o'clock dinner bell. 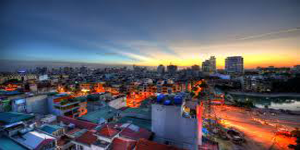 In these twilight hours, the fragrance of the tropical exoticness of the Vietnamese kitchen mingles with the sweet smoky incense of the ancestor halls and the sultry scent of women's perfume as they prepare for the evening, beckoning the visitor to explore this intriguing city. 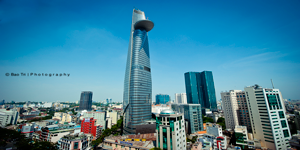 Ho Chi Minh City, Saigon, whatever you call it, is outstanding. Its rhythm pulses. It beats from the communist presidential palace to the soaring Norte Dame cathedral. 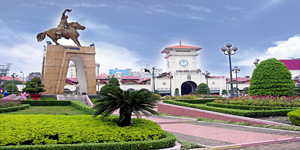 The busy markets filled with goods and services, traditional and modern, thumps amisdt the superb French colonial architecture of a time unforgettable. 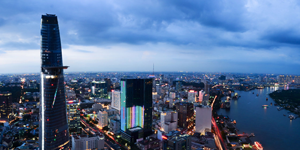 Ho Chi Minh City has a flavour and atmosphere unlike any other place in the world. 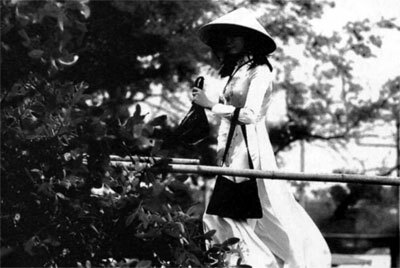 The traditional Ao Dai as shown in the photo above remains the dress of choice for many Vietnamese young ladies till today.